Pics Of Your Fave Golfing Memory. I have quite a few, and this one popped up on my facebook feed earlier today. Koiom at his sucky best sticking himself in the foot with one of the tee marker spikes. Dr Goldy administering first aid whilst the rest of us guffawed at Koiom's predicament. Enough words for now, and I will let pic below complete my story. Feel free to post up yours, good, funny or otherwise. Madam, Bump, Goldy and I think it was Placegetter. I dont remember as much as I should of as I had half a slab that round! Surprised I got the yips that day.Or maybe it was hiccups instead? This is where the infamous kaw kaw happened! It would had to have been Placegetter who took the photo, he was definitely in our group. He was also the one who drove a very chirpy me down the coast that day and a very quiet me back Sunday night. The day OB brought his interracial partner to golf. Just wait until i find the time to upload that bunker vid of iron mick. Ps Maxxx would sink through hardened concrete coz he is a unit. 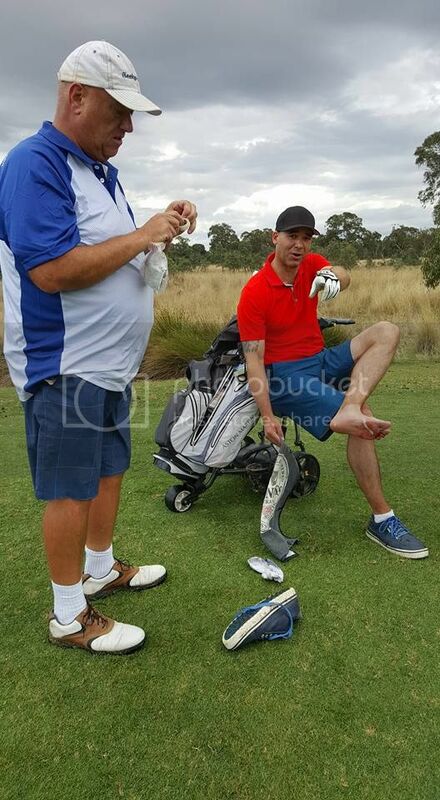 I have quite a few, and this one popped up on my facebook feed earlier today.Koiom at his sucky best sticking himself in the foot with one of the tee marker spikes.Dr Goldy administering first aid whilst the rest of us guffawed at Koiom's predicament.Enough words for now, and I will let pic below complete my story.Feel free to post up yours, good, funny or otherwise. “I think it was Placegetter”. The moment you know you have become irrelevant. Hit a wayward drive, chased its flight. Kicked and upturned the tee marker and stepped on the spike. Muzz taking his oversized marker for a spin was memorable. His sleeves however left something to be desired. Reckon the one of muzz with a cut above his eye from an errant wedge is arguably better.